Christopher Kelly, a close adviser and fundraiser for former Gov. Rod Blagojevich, died Saturday, September 12, just days before he was to report to federal prison to serve at least eight years for two of three criminal cases against him. He was 51. Law enforcement officials reportedly were looking into a drug overdose. Kelly would have been a key figure in the ongoing corruption trial of Blagojevich, scheduled to go to court in June 2010. Kelly was indicted as part of “Blagojevich Enterprise,” an extensive scheme that allegedly began in 2002 to use the governor’s office for private and political gain, including auctioning off the U.S. Senate seat once held by President Barack Obama. Kelly was indicted along with the former governor; his brother, Robert Blagojevich; former campaign manager and lobbyist Alonzo Monk; Springfield lobbyist William Cellini; and former chief of staff John Harris. Kelly pleaded not guilty to those charges. Shortly before his death, however, he pleaded guilty today to two counts of mail fraud in one of three federal indictments against him. But it's unknown whether he was cooperating in the ex-governor's ongoing corruption trial. Read his plea agreement here. The Burr Ridge resident UPDATED: was supposed to report to jail September 18 and agreed to forfeit $450,000 for a scheme of rigging roofing contracts with two major airlines and using illegal kickbacks for personal use. On top of a three-year prison sentence for a separate tax fraud case, his plea Tuesday calls for a nearly five-year sentence. Kelly pleaded guilty to rigging bids to steer $8.5 million in inflated contracts for roofing work done on American Airlines and United Airline facilities at O’Hare International Airport between 1998 and 2006. The scheme benefited BCI Commercial Roofing Inc. in Markham, of which he is president and owner. About $1 million of the kickbacks went to repay gambling debts and a home loan, according to the plea. Some of the kickbacks also went to entities associated with Tony Rezko. Kelly originally was charged with 11 counts of mail fraud and six counts of money laundering for the scheme. His December 2007 indictment charged him with using corporate funds from his roofing and consulting firms to pay illegal gambling debt. He received three years in prison for those charges. His February 2009 indictment includes the O’Hare kickback scheme. His plea seeks nearly 4.5 years more on two counts of mail fraud. He still faced trial for his involvement in Blagojevich’s ongoing corruption case, scheduled for court June 2010. That indictment is here. After months of being under a cloud of an alleged scandal that led seven trustees to resign, the University of Illinois board of trustees now has all positions filled before its first meeting of the school year. Gov. Pat Quinn appointed five new trustees this morning, filling a total of seven seats that were vacated. Two trustees refused to resign and remain on the board. The board has been under public scrutiny since June, when The Chicago Tribune exposed a clout-heavy admissions process that favored more than 800 students over some more qualified applicants. Karen Hasara of Springfield (Republican) is a former mayor, state legislator (House and Senate, 1980-1993), local mass transit trustee, circuit court clerk, county board member, real estate executive and teacher. Timothy Koritz of Roscoe (Republican) is an anesthesiologist, a former U.S. Air Force flight surgeon and officer in charge of a space shuttle emergency medical response team. Edward McMillan of Greenville (Republican) is an agribusiness executive. He also is a reappointed trustee. Quinn appointed him in March, but he never received Senate confirmation. Pamela Strobel of Winnetka (Democrat) is an Exelon Corp. executive and lawyer. Carlos Tortolero of Berwyn (Democrat) is founder of the National Museum of Mexican Art and a longtime arts advocate. They join Christopher Kennedy, a Democrat and Chicago’s Merchandise Mart Properties president, and Orland Park’s Lawrence Oliver II, chief legal counsel for the Boeing Company. He lists himself as an "independent." Quinn appointed them August 26. Democrats Frances Carroll and James Montgomery remain. Quinn said last week he would not force them to resign because he wanted to avoid a lengthy legal battle over his executive powers to do so. Both were appointed by former Gov. Rod Blagojevich. Frances’ term is set to expire January 2011, Montgomery’s January 2013. However, Mikva said he anticipated the board’s and the university’s quick and complete recovery. McMillan, whom Quinn appointed in March to fill a vacancy, said he attended only a few trustee meetings before resigning at the recommendation of Quinn’s investigative panel. He said he had no angst when the Tribune’s investigation broke because he had no part in the process and was never mentioned as being involved. He resigned but informed Quinn he would like to continue serving on the board if the governor saw fit. “I’m pleased the governor has the confidence in me to let me continue,” he said this morning. Going forward, McMillan said he was pleased to see such a diverse group of trustees from various professions and geographies. While having so many new members without a chairperson is going to pose challenges, he said he expects the first few items of business to include electing a new chair, establishing a new code of conduct and developing new ethics standards for the board. Those could be on top of the state and university ethics rules already in place, he sad. The board has 13 members, including the governor and three students. No more than five can be from the same political party. The board oversees the university’s three campuses in Chicago, Champaign-Urbana and Springfield. The Democratic primary election between Illinois Gov. Pat Quinn and Comptroller Dan Hynes gained another dynamic Wednesday as Hynes officially announced his candidacy for governor with a proposal to raise the state income tax based on income. Before today, however, Hynes had not officially announced where he stood on an income tax increase other than saying the legislature and governor should look to cut spending first. On Wednesday, he announced, first in Chicago then in Springfield, a three-step plan that would rely on various cuts and efficiencies this fiscal year and propose a graduated income tax next fiscal year. Because the state Constitution specifies Illinois’ income tax rate is a “flat” rate applied evenly to individuals, as well as a separate flat rate applied to businesses, changing the tax structure to a graduated rate would require a constitutional amendment. Hynes said he would want the General Assembly to approve a measure to put the question to voters about whether to change the Constitution in the November 2010 election. The graduated rate, according to Hynes, would range from the current 3 percent on individuals to a new 7.5 percent, which Hynes said would only apply to individuals who make more than $1 million a year. He would not change the corporate rate. If instituted in January 2011, Hynes said the new tax would generate $5.5 billion to help close the budget deficit his second year in office. Quinn, in his March budget proposal to the General Assembly, proposed raising the individual income tax rate from 3 percent to 4.5 percent and the corporate rate from 4.8 percent to 7.2 percent, but he would keep the rate “flat,” which would not require a constitutional amendment. “Rather than taking years to enact through a constitutional amendment, it could have been done quickly through an act of the legislature,” said John Kupper, spokesman for the Taxpayers for Quinn campaign. Quinn also wanted to triple the personal tax exemption, which he said in March would mean that about half of the state’s taxpayers would pay less, while the other half would pay more than they currently do. Both Quinn and Hynes use similar language — cut spending before seeking higher taxes — (we quoted Quinn as saying it in June, when budget negotiations hit a stalemate). Quinn cut $1 billion in spending already and said he is working toward another $1 billion as part of the final budget agreement for fiscal year 2010 (the current year). But Hynes says Quinn’s approach to cutting is across-the-board and, therefore, unfair. Instead, one of Hynes’ cost-cutting proposals is to fire half of Blagojevich’s political employees or appointees making more than $70,000 a year. Hynes said his campaign identified 1,600 such employees through state payroll. Firing half of them, or 800 workers, would save $100 million a year, he said, but it would be up to the governor and his agency directors to determine which half to fire. Other immediate cost-saving measures proposed by Hynes today include reducing discretionary grants, slashing contracts for advertising, consulting and other professional services and closing so-called tax loopholes by expanding the state sales tax to include such “luxury” services as Botox cosmetic injections, car and truck rentals and membership of private clubs. He’d also borrow $1.5 billion to pay down backlogged bills, which he said would leverage enhanced federal reimbursements temporarily available through the federal stimulus package. Several of his ideas — instituting a graduated income tax structure, building three new casinos, increasing the sales tax on cigarettes by $1, closing corporate tax breaks and prohibiting the state from rolling over unpaid bills into the next fiscal year — have been proposed within the past few years but have all stalled in the legislature. 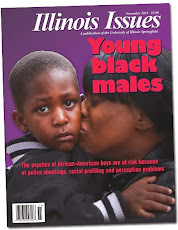 Check out the September edition of Illinois Issues magazine. Find a profile of Senate Minority Leader Christine Radogno, who has taken her party away from the legacy of James 'Pate' Philip, according to writer Kevin McDermott, in "Her own style." 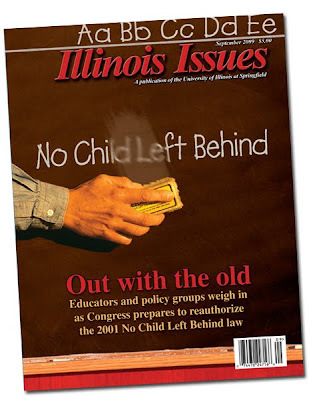 In our cover story, educators and policy groups weigh in as Congress prepares to reauthorize the 2001 No Child Left Behind law. See "Out with the old." And get a preview of an Illinois Supreme Court case that has potential to clarify what nonprofit hospitals need to do to qualify for property tax exemptions. Read "Charity care" before the case's oral arguments, scheduled for September 23. In the print edition, only, University of Illinois at Springfield professor Christopher Mooney analyzes Gov. Pat Quinn's "populist" style as he calls attention to direct democracy concepts of recall and citizen initiative in "Let the people speak." Also in print-only, MarySue Barrett, president of the Metropolitan Planning Council, pens a guest essay about "Wise spending," or a method she says would get infrastructure investment right. As always, the print edition also includes, among other monthly features, the award-winning column by Charlie Wheeler, director of the Public Affairs Reporting program at UIS. This month, he says, "Illinois' budget is the most out-of-whack in recent history."